Click the tab to view questions for that product. Click a question to view the answer. Can I install Samplitude SE 9 on Windows 7? I see a Wrong Operating System warning. Yes, you can install Samplitude SE 9 Windows 7. When you try to install a version of Samplitude prior to version 11 on Windows 7 you may be prompted with an error message indicating a wrong operating system. If so, simply navigate to install.exe on the installation DVD, right-click on install.exe and set compatibility mode. Installation should now complete as expected. Note: Samplitude SE 9 package is not available in all regions or products. Contact your local dealer for the specific software included with your purchase. V-Balanced I/O is a World-First technology developed by the award winning Infrasonic development team of SIMS Audio. V-Balanced I/O allows Quartet to be used as a balanced 2in/2out interface, instead of as an unbalanced 4in/4out interface. The I/O-type selection is done through a simple click on the "Balanced Link" button of the driver control panel [ Show ]. When shifting to Balanced I/O, Headphone output, MIC, and INST input will all shut down. You can then monitor the pure, high quality balanced signal without upgrading your hardware. This feature was first made available in December 2008 with driver version 1.18.4. (See drivers page). Select Windows Drivers / Quartet Tab. See also the related FAQ about the advantages of a Balanced Signal. What is the advantage of a Balanced Signal? A Balanced Signal allows the use of Reversed Phase Theory to avoid HUM or RF noise that comes within cable transfer. It is a method exclusive to Pro-Audio equipment, and used most often in long distance signal transfer (i.e. long cables), situations that are sensitive to noise and alterance of sound. See also the related FAQ about V-Balanced I/O. What does the red light indicate in the control panel by the clock source? Is it possible to combine multiple Quartet soundcards in one computer to be able to use more channels at once? Unfortunately, two or more Quartets cannot be installed in the same PC. What is the lowest possible click and pop-free latency? The lowest stable latency is 1ms at 44.1kHz/24bit and 1.33ms at 96kHz/24bit with 80% CPU load. I��ve tried to capture video with my TV tuner card, but the sound is missing. If you have connected the audio output of the TV tuner card to the line (3/4) input of Quartet, please attach H/W input 3,4 to WDM input 1,2 in Free Mixer. Am I allowed to use an inexpensive karaokee microphone with the Quartet soundcard? Certainly. Quartet will accept dynamic microphones with a simple unbalanced TS jack. And if the output signal of the microphone is insufficient, you can apply +60dB amplification via a jumper on the soundcard. Is there any offset sample delay between channels? No, there is no measurable delay between line input L/R channels. What is the difference between the Infrasonic Quartet soundcards and other PCI soundcards? 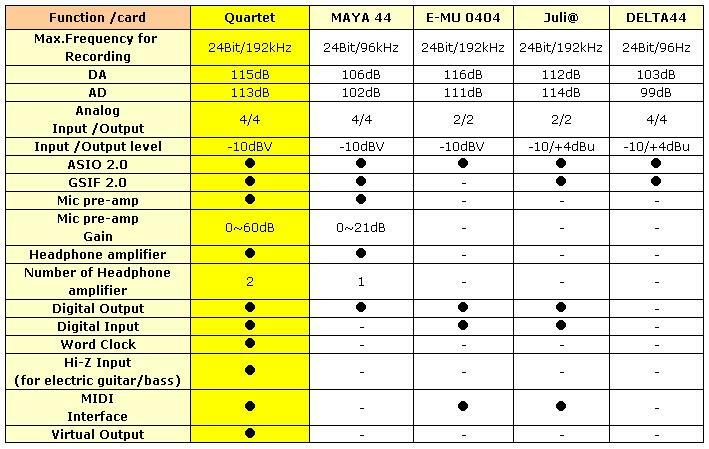 Please see soundcard comparison chart. Where can I download the Quartet Control Panel User's Guide? Please see the Manuals download page. How do I use Phantom Power with the Infrasonic Quartet souncard? Please follow the instructions and proceed carefully. If you do not follow the instructions, the product could be critically damaged. You must turn off the system before making any connection change to the microphone. If not, it could cause a fire or electric shock that may be harmful to you and your product. Turn off your computer before you connect the microphone to Quartet. Make sure the microphone is plugged in properly before you turn your system back on. If you connect the microphone when the system power is on, it may cause electric shock that ccould damage the QUARTET critically. The QUARTET is a PCI card interface with no XLR input. To use a microphone with a XLR plug, you can use TRS 1/4" converter jack. 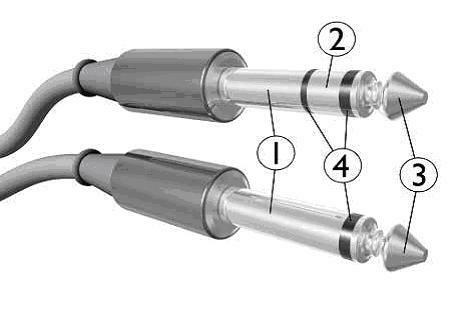 Since the TRS jack contains the tip, ring, and sleeve parts linearly, it may cause electric shock or short circuit if you connect/disconnect it while the system power is on. 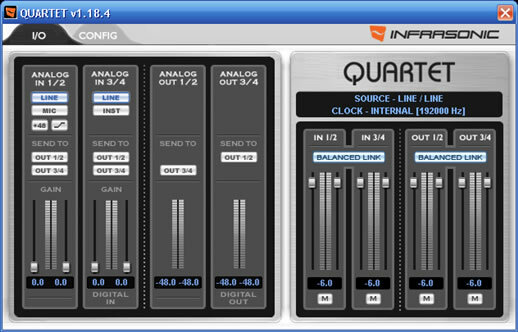 How do I set the gain jumper of the Infrasonic Quartet soundcard? Usually PCI audio interface cards do not come with a built-in microphone preamp. Even cards that come with preamps don’t have gain adjustability, or if they do it is digitally controlled. Digital gain adjustment will add noise to the output because the gain is increased digitally. However, the QUARTET PCI interface has a function that allows the user to manually adjust the gain on the hardware itself, instead of digitally. The following article is instructions on how to properly set the jumper of your new QUARTET PCI interface. Jumper settings can be optimized to best suit your microphone and source. Once the jumper is set, manual gain adjustments are available thru the control panel. If your jumper settings are not correct, you may have excessive noise and/or distortion in your recorded tracks. There are three different jumper options on the QUARTET (+20dB, +40dB, and +60dB). The above image illustrates the jumper positions from left to right (+20/+40/+60dB). You can adjust gain in control panel (0~+18dB), but it is better to adjust jumper setting than control panel setting. You will get less noise and better sound quality by adjusting jumper. Once your jumper is set in the correct location, it is possible to electronically control the gain from the control panel up to +18dB (0~+18dB). The Pad is a switch which further reduces the gain of the microphone preamplifier. It can be used in many situations such as when recording a high SPL source, so that your preamp does not clip. Primarily, the pad is used with a condenser microphone (or other high sensitivity microphones) when you are recording high SPL sources such as a drum kit or loud guitar amplifier. It is also useful when recording a dynamic/ribbon microphone at very close proximities. The PAD with -20dB three thing 20dB (about 10 boats) degree input of big level clip Ping it will be able to record without because is becoming. The image on the left is the pad on; and the right side is Pad off. The QUARTET is delivered from our factory with the pad engaged. It is recommended to change the pad jumper settings to take advantage of your Quartet. It can often times correct a shortage of gain when using a dynamic microphone or sensitivity problems when you use condenser microphones. 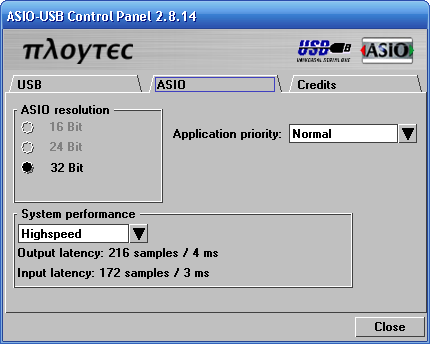 How do I modify the ASIO latency setting? Find the ASIO control panel of Amon inside the settings of your host software under the ASIO tab. View Control Panel. My Deux is not recognized by my PC/Mac. Most likely your Firewire Bus is not providing sufficient power. To remedy this, connect a 12 V, 0.5 A DC adapter to the Deux. Caution: You must first confirm that the center pin of the power adapter is negative (contact your local dealer). The DC adaptor for the DeuX is also avalable for purchase separately. Which shock mounts and stands would work for this UFO Microphone? The UFO is a USB microphone equipped with a standard mount screw hole. You can use any standard microphone mount or any standard shock mount with the UFO. How do I install the shock mount bands? Please see the video below for a demonstration of how to install the bands on the shock mount. How do I configure digital connections? Please follow the tutorial below to connect your Blow speakers to digital inputs. A Blow speaker with Digital-to-Analog Converter (DAC) is required. Video Introduction to Digital Connections (above). I have a BLOW5D connected to the Quartet. the audio from an analog input seems "warmer" than a digital source, yet the frequency response is different. How can I set the BLOW5D for flat frequency response without too much emphasis on low frequencies, but with a high resolution? BLOW5D has excellent Digital/Analog converters so you should try connecting them digitally to achieve the highest resolution sound. What is commonly called a "warm" frequency response is usually bad transient response ( See Wikipedia ). You should decide what would you like at home: detailed studio sound, or nice "hi-fi" sound. Try connecting the speakers both ways. When you are working, you probably use the monitors with the digital input. When you listen to music for pleasure, you can enjoy warmer audio by using the the analog inputs. Note that the BLOW5D is greatly adjustable to your room acoustics via the Room Control dip switches on the back of the monitors . If you place the speakers close to the wall or in a corner, you will hear too high a low frequency level (view example). The Room Compensation Control allows you to decrease the bass range depending on the room acoustics. You can select the switch to reduce low frequency level in 3 steps of -2dB below 500 Hz.. If you are unsure which is the best setting, you can listen to the bass response with a freeware signal generator. Set the switches to 0dB and flat. Start listening from 500 Hz. 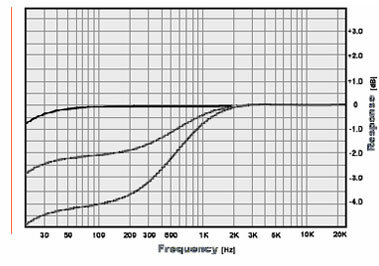 Continue listening down to 50 Hz and if you don’t find any louder or quieter frequency range, then your frequency response is approximately flat. What is the difference between BLOW5 and BLOW5D? Other than the Digital-to-Analog Converter (DAC)., the specifications for the BLOW5 and BLOW5D are identical. The BLOW5D is equipped with a high quality DAC, whereas the BLOW5 is not. The DAC is contains BrownBurr PCM1796 Operational Amplifiers and has an impressive -123dB signal-to-noise ratio. In most digital recording situations, a prerecorded digital signal is converted back to analog via D/A conversion in an audio interface. In such a configuration, there are many variables that can degrade the sound before it reaches the monitors. The internal D/A converters in our monitors eliminate many of those variables. The internal D/A also allows the BLOW5Ds to have much less signal degradation than any other analog monitoring speakers due to the digital signal. Can I upgrade Blow5 to Blow5D? Yes, you can upgrade the BLOW5 to the BLOW5D by inserting a DA-912 digital module. The DA-912 is available from your local dealer. Why can't I change the volume level within the control panel at 192kHz sampling rate? It is due to a hardware limitation in order to keep the sound quality as high as possible. However volume level control is still possible via the built-in Windows sound mixer under WDM/DirectSound applications. My Windy6 keeps disconnecting. What can I do? If you are using Windy6 on a laptop, the 4-pin firewire plug can come loose over time, so please make sure that the data and the DC power cable connections are tight. If you are still having problems with the 4-pin cable, please try connecting to the 6-pin firewire port. No Primus a25 entries found.